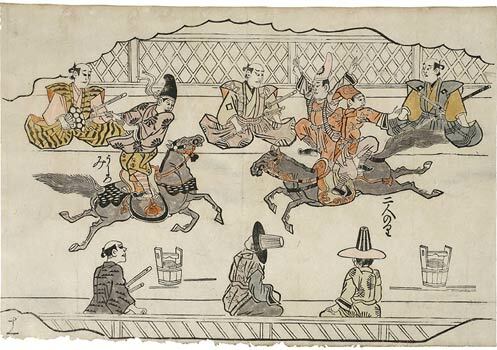 Sheet 11 from an unidentified series of 12 prints The 7th Korean diplomatic mission to Japan was also accompanied in 1682 by a troupe of equestrian acrobats who demonstrated their art in Edo before the shōgun, various Japanese dignitaries and their ambassador. It is generally assumed that Hishikawa Moronobu drew the designs for this series of prints, although it may also be by one of his students or by Yoshida Hanbei (active 1664 - 1689). Korean horsemen are displaying their riding skills in front of their ambassadors and Japanese dignitaries. It is know that in the year 1682 Korean emissaries came to Japan, and are reputed to have been accompanied by acrobats on horseback. The shōgun was present at their performances in Edo. It may well bet hat the woodblock prints were published in this context.